LTR landing-taxi-recogniton light | Kuntzleman Electronics, Inc.
KUNTZLEMAN ELECTRONICS is proud to introduce the latest addition to our LSA and EXPERIMENTAL aircraft line of lights. Made in the USA, we call it the LTR which stands for Landing-Taxi-Recognition. 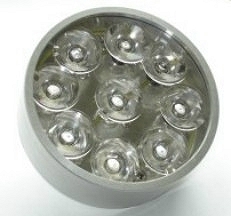 The LTR consists of 9 extremely bright LEDs, focused through special lenses. This results in a white beam of light that has been measured with a light meter to be 2 1/2 times the brightness of a 55 watt halogen lamp while drawing 1/3 the current and 1 1/2 that of an HID lamp at about the same current. Powered by 12 to14 volts DC it uses only 1.35 Amps of power. The LTR dimensions are 3” Dia. X 1” deep and weighs less than 6 ounces. Flashing one or two LTRs on & off can be accomplished with our WIG-WAG circuit (see below). You must see the LTR in operation to believe the light output. Sold with a money back satisfaction guarantee. This 3” dia. 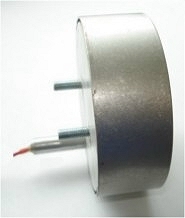 by 1” deep sealed unit is made of anodized aluminum with a polycarbonate face and resembles a hockey puck. The rear surface is flat and has two #10x32 studs 1” apart for mounting and negative electrical connection, it also has the positive 12VDC wire coming out of the back. Go to the “INSTALLATIONS” page to see several installations of the LTR. 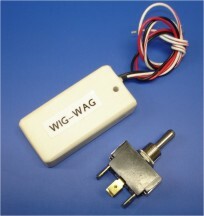 Our new WIG-WAG Circuit comes complete with a DPDT switch and complete instructions. The Wig-Wag will allow the operation of one or two LTRs in either an alternating flash mode for recognition or a steady on mode for landing with just the flip of a switch.Note: The Wig-Wag is designed to be used on our LTR or any light drawing no more than 3 Amps of current.